The Foodie Monster! : Pok Pok Wings....Not Worth the Hype! Pok Pok Wings....Not Worth the Hype! I had been looking forward for a chance to try Pok Pok's new spin on the asian chicken wing craze, especially after trying some great Korean wings from the likes of Bonchon and Japanese wings from Tebaya. 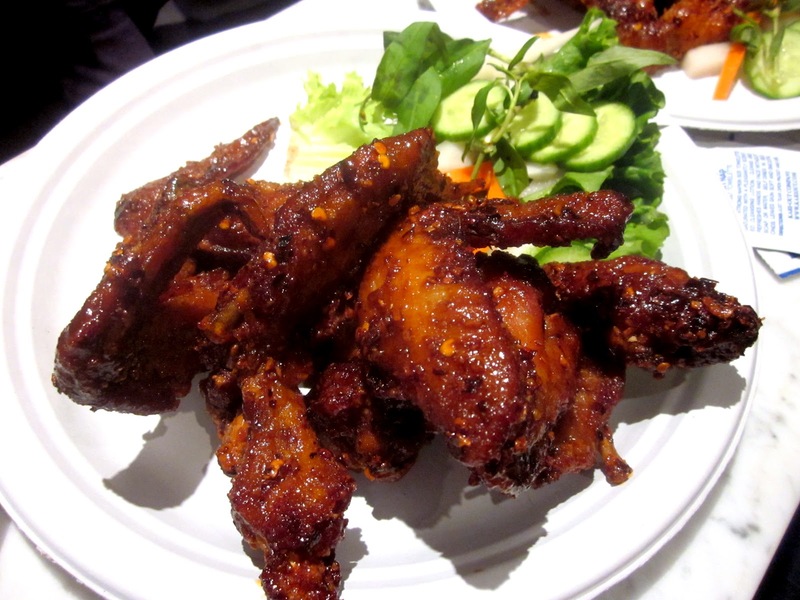 Pok Pok's wings are Thai style, marinated in fish sauce, fried, and tossed in a sweet caramelized fish sauce. The wings can come mild or spicy. Originally made famous in Portland, Pok Pok opened a new location in NYC in the Lower East Side in the space formerly inhabited by Baohaus...and man it has been busy since! A whole order (6 full wings) are $12.50 and a half order is $7.25, and comes with a side salad. When the wings came our group was excited, but after having the wings the excitement waned. The wings actually had a nice complex flavor, but after a few bites the predominant flavor became salt. The first wing tasted ok, but each additional wing became harder and harder to eat! If you use fish sauce at all, it's a very salty ingredient, even more so than soy, and the fact that they marinate the wings in fish sauce, and toss it in more fish sauce just makes it more salty. The only way I could see this working is if you're drinking some ice cold beers with the wings, since buzz + beer + salty fried food = tops. Otherwise, you can do better just having some Bonchon.